OhGizmo! 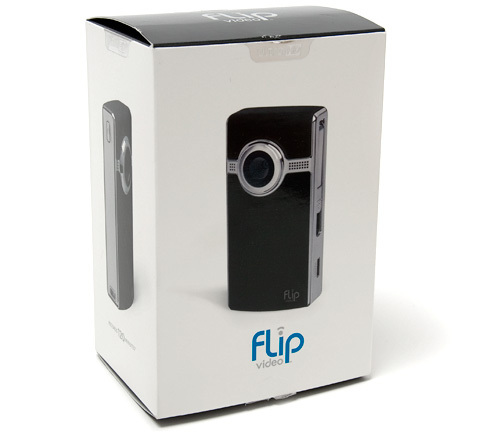 Review – Flip UltraHD | OhGizmo! YouTube and other video sharing sites have made finding and watching clips of men getting hit in the groin by footballs extremely easy for everyone from kids to grandparents. But it was a company called Pure Digital that made capturing hilarious clips like that just as easy for anyone capable of pushing a button. 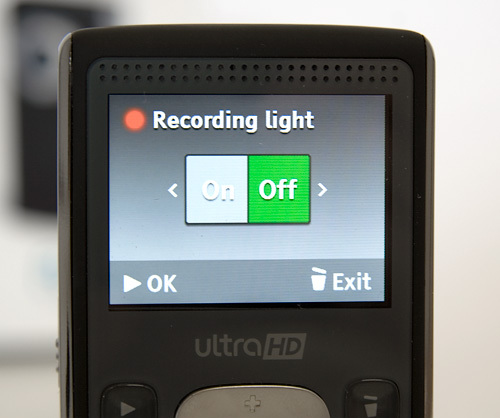 Their Flip line of digital camcorders are known for being as easy to use as it gets, and with the addition of the MinoHD and the UltraHD pictured above, creating HD content is just as simple. I spent a few weeks playing around with the Flip UltraHD and while I was initially worried that I would be frustrated by such a simple device, I actually walked away appreciating its simplicity. So if you’ve been looking for a way to shoot HD video that’s as easy, if not easier, than a point & shoot still camera, you’ll want to check out my full review of the Flip UltraHD after the jump. One of the best parts of the Flip UltraHD is its small and compact size, so it’s not surprising that the packaging is just as compact and minimal. It’s a clean and simple cardboard box with product shots that show off the camera from all sides, so in the store you’ll know exactly what you’re getting ahead of time. And as is the trend these days with gadget packaging, once you remove the Flip UltraHD’s outer box there’s a pair of flaps that really serve no other purpose than to provide a dramatic reveal of the device while you’re opening it. 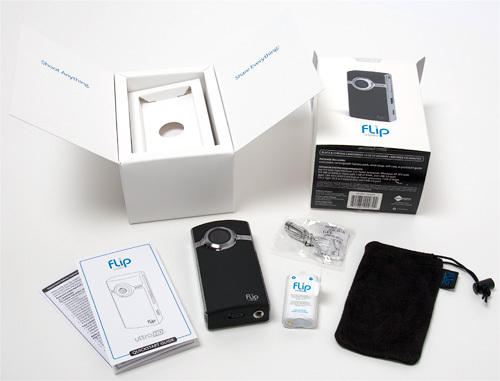 Of course the first thing you’ll find inside is the Flip UltraHD itself, but digging a little deeper also reveals a removable rechargeable battery, a microfiber case, a lanyard and a set of printed instructions and warranty info. Given the UltraHD’s box was already open when I got it, I definitely wasn’t the first person to put my grubby paws on this particular review unit. However, I did notice that the lanyard had yet to be opened, which I found odd. It easily attaches to the Flip UltraHD to provide a bit of extra security while you’re carrying it around, though I’ll admit I didn’t much care for the bright silver finish. But it’s nice that it’s included. And like I already mentioned, a microfiber case is also included which is nice since the Flip UltraHD has a lens but no lens cap, so it’s prone to getting mucked up with fingerprints and other smudges. There’s a nice little ‘Flip’ tag attached to one side so you never accidentally use the case to protect some other gadget in your collection, but while it does an adequate job of keeping the UltraHD clean and free of scratches, it provides nothing more than cosmetic protection. So if you were to drop the Flip while it’s in this case, there’s a good chance it’s still going to break. I also want to mention that I found it rather difficult to quickly slip the Flip UltraHD into this case, particularly when I was in a hurry. It’s made to fit the UltraHD rather snugly, and because the device has a rubberized texture on the outside, sliding it in was often a chore, to the point where I swapped it for an old microfiber sunglasses case instead. If the included case was just a bit larger though, it would be just fine. Not only does the Flip UltraHD’s rechargeable battery look like a couple of AA’s wrapped in plastic, but it is a couple of AA’s wrapped in plastic. So if you run out of juice with no time or means to recharge the included battery, you can easily swap it for a set of standard AA’s that you can buy anywhere. Unfortunately I haven’t been able to find how long the included rechargeable battery will record for, but given my own tests you’ll probably run out of storage space on the device before you run out of power. Like I mentioned at the start of my review, the name of the game when it comes to the Flip line is simplicity. 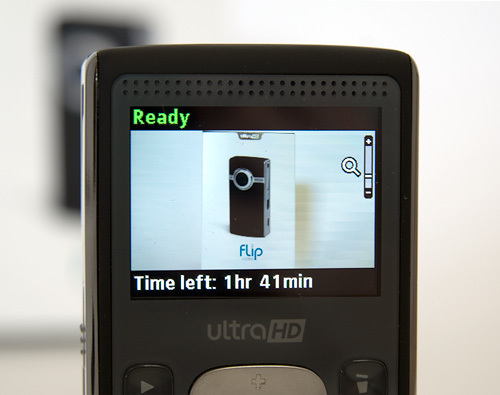 And this shot of the back of the Flip UltraHD shows the device’s extremely simple user controls. In fact, all-in-all you really only have to deal with 7 buttons back here, including a 4-way directional pad, a big red record button, a play button and a delete/trash can button. Of course some of these buttons do double duty depending on what you’re doing with the device, but the user interface, which I’ll talk about later, is just as simple. I also want to point out that the black matte finish on the UltraHD has a really nice rubberized texture to it which makes it particularly difficult for the device to slip out of your hand or pick up fingerprints. So you clumsy types or those with particularly greasy digits might want to give it some serious consideration for that aspect alone. Now I was sent the Flip UltraHD for review, which as you can see isn’t thin by any stretch of the imagination. But there’s an even more compact and svelte HD model from Pure Digital known as the MinoHD. The biggest difference between the two, besides size and appearance, is the on-board storage. While the MinoHD comes with 4GB of memory allowing it to record 60 minutes of 1280x720P HD video, the UltraHD comes with 8GB allowing it to record 120 minutes instead. 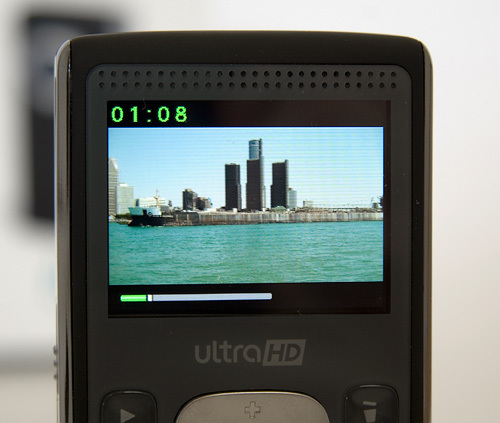 But oddly enough, the UltraHD retails for about $30 less than the MinoHD. $249.99 compared to the MinoHD’s price tag of $279.99. So unless size is a huge issue for you, I most definitely recommend the UltraHD model since you basically get more for less. 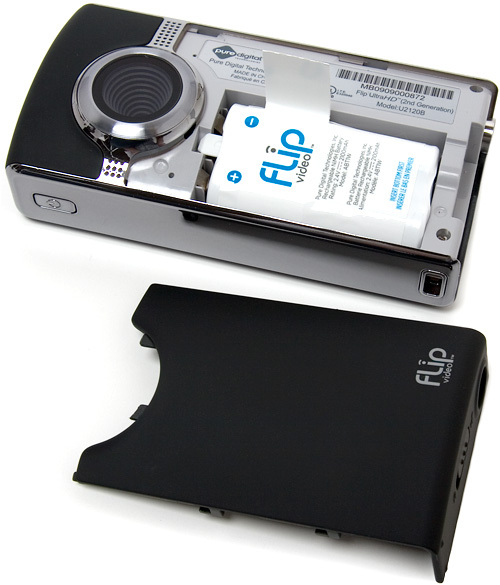 On the bottom of the Flip UltraHD is a sliding lever which is used to lock the removable battery cover, as well as a standard sized tripod mount. While you might think it’s kind of ridiculous to mount such a small camcorder to a tripod, that’s exactly the reason you’d want to. Because it’s so small it’s often hard to hold steady, particularly if you’re outside dealing with the wind. And performing pans while holding it one hand rarely leads to smooth results. So having the option of using a tripod is important if you intend to shoot anything other than shaky UFO footage. On the other side of the UltraHD you’ll find an HDMI port which is another nice addition. 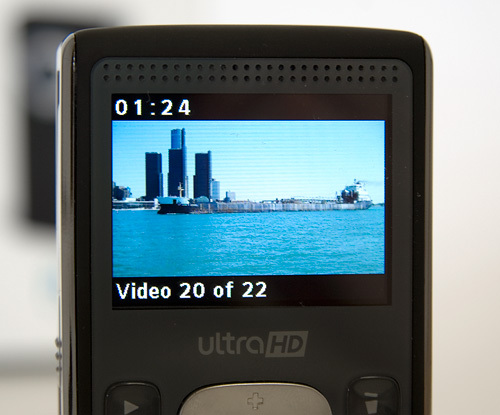 It’s really hard to enjoy and appreciate your 720P clips on the device’s 2-inch LCD display, so being able to connect it to the hi-def TV in your living room to view the clips in their native resolution is a much better option. The downside? That’s a mini-HDMI connection which means there’s a good chance you’ll need to buy a mini-HDMI to regular-HDMI cable because one isn’t included. On this side of the UltraHD you’ll also find the device’s ridiculously handy and convenient built-in USB connector. Sliding down a button causes a small arm to pop-out which features a USB port on the end. The arm is long enough to easily connect to even a crowded USB hub or laptop, and the fact that you don’t have to carry a USB extension cable or some other proprietary adapter cable with you at all times is simply brilliant. And when you connect the UltraHD to a Windows or OS X PC it shows up as a mass storage compliant device allowing you to easily play or transfer the MP4 videos you’ve recorded. 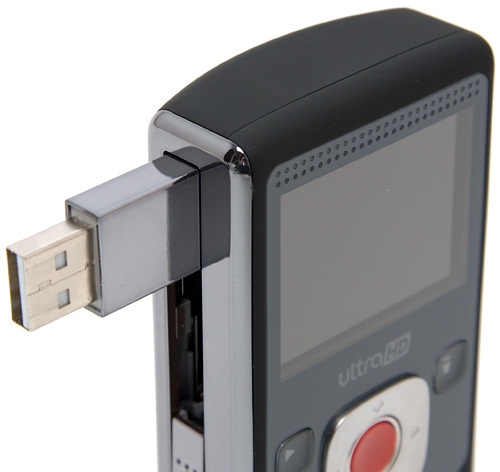 The USB connector is also used to charge the Flip UltraHD, but oddly enough it has to be connected to a laptop or PC’s USB port. I tried connecting it to the USB AC adapters that come with the iPhone and older iPods, and the device simply refused to charge. But since you’re able to swap out the rechargeable battery with regular AA’s in an emergency, being limited to charging the UltraHD via a computer isn’t as big an issue as far as I’m concerned. On the front of the Flip UltraHD, just above the battery compartment, you’ll find the lens which is flanked by what I have to assume is the built-in microphone on one side, and a red LED tally light on the other. One of my complaints here is that it’s a fixed lens, which means the zoom option that’s offered while you’re recording is actually a digital zoom. For some reason this didn’t dawn on me until I was watching some recorded footage and noticed how blurry (interpolated) parts of my videos were. As anyone who’s ever used a digital P&S camera will tell you, digital zoom is bad, and it’s no different with the Flip UltraHD. My advice? Forget that it’s even an option. The UltraHD also doesn’t come with a lens cap at all. 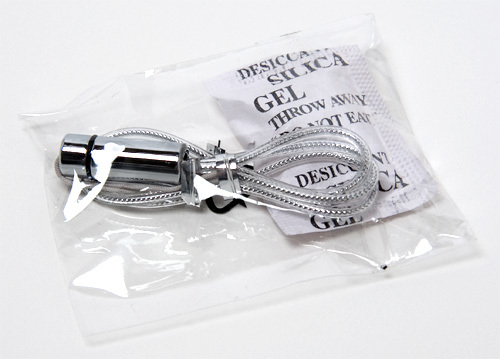 The included microfiber case is a nice alternative, but there’s a good chance you’re not going to use it every time you stick this thing in your pocket. So I would have preferred if Pure Digital had included some kind of automatic lens cover like most P&S still cameras have these days. Or at the least, simply recess the lens cover so it’s less prone to being touched or scratched. Now in this age of touchscreens a device with minimal buttons can still be extremely complicated when it comes to the user interface, like the iPhone for example. But thankfully the simple and easy-to-use mentality of the Flip UltraHD carries over to the UI as well. Start up time is almost instantaneous, maybe a second or two, and once it’s booted it takes you straight to the record screen showing you what’s in front of the lens. 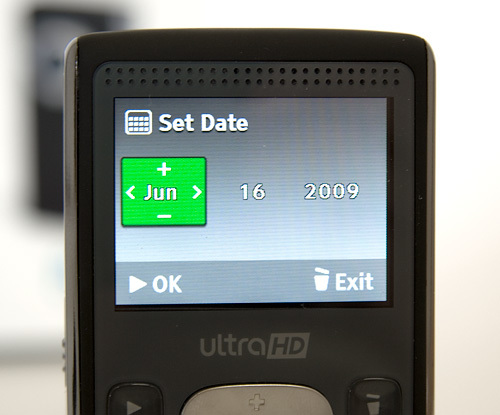 On the 2-inch LCD display you’ll also find a slider indicating your zoom level which can be adjusted by pressing up and down on the 4-way controller (remember, it’s digital, so just ignore this) as well as how much recording time you have left. 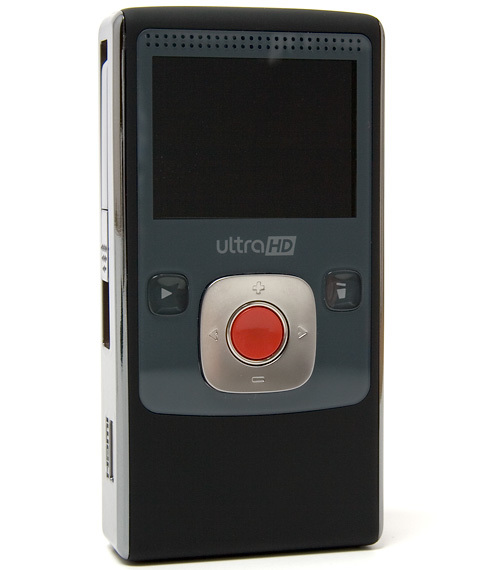 Now when you’re ready to record all you have to do is hit the big red record button on the back of the UltraHD and the device will start capturing. And instead of showing you how much recording time you have left, the UI instead shows how long the current clip has been recording for. So I guess it’s important to make a mental note of how much storage time you have left before you start capturing. And the zoom slider sticks around since you can actually zoom in and out while the UltraHD is recording, if you’ve decided not to listen to my previous complaints. When you’re not recording, hitting the play button takes you to the last video you recorded and you can either watch it by hitting play again, or you can scroll through the other videos by pressing left or right on the 4-way controller. The videos are numbered in the order they were captured, and above the thumbnail you can see how long each clip is as you step through them. While playing a video you get a simple slider underneath showing your current position compared to the entire length of the clip, and at any time you can hit the delete button to erase the current video you’re watching, or erase all of them in one fell swoop. In fact the most complicated part of the UI is the setup screen which is only accessible by holding down a button while the device is starting up. In here you can set the time and date so your files get properly tagged when they’re saved, as well as a handful of other options like being able to turn off the red tally light on the front of the device so your friends and family don’t know their antics are being recorded. Now what would a review of a device designed for capturing videos be without a few video samples? Now the Flip UltraHD obviously uses compression when it’s capturing footage, and in this case its H.264 MP4 files at 30 frames per second with an average bitrate of about 9 Mbps. To be honest I wasn’t expecting much when it came to the quality of the footage, but I was pleasantly surprised when watching a few clips on a proper hi-def display. Usually when videos get compressed the first thing to go is color data (see every single thing on YouTube) but the colors looked really bright and crisp on everything I shot. 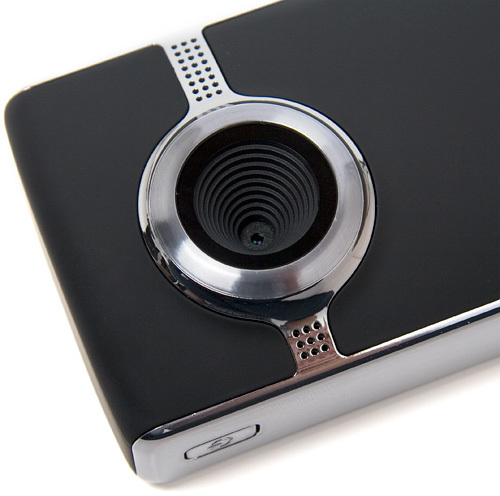 One downside though, which will keep the Flip UltraHD out of the hands of professionals, is its rolling shutter. While footage is captured progressively, the image from the sensor is actually read line by line which can lead to weird artifacts when things are in motion. For example, here’s a clip taken from a moving streetcar in downtown Toronto. Notice how objects like trees, poles and even the transit stops in the foreground all seem to lean when the vehicle is in motion. It’s not immediately obvious until someone points it out, and since even the new video-capable DSLRs exhibit the same problem, I don’t think it’s a deal breaker for most consumers. However, even with those issues the UltraHD can still produce some extremely nice footage in the right conditions. Here’s a short clip of a small cruise ship pulling away from a dock with other assorted air and watercraft in the background. And if you were wondering how well that built-in microphone works, check out this clip from the 2009 Red Bull Air Race held in Windsor, Ontario a few weeks ago for the sound of the engine roaring on Mike Mangold’s plane while he makes his way around the course. Pure Digital positions their Flip devices as being one of the easiest ways to capture and share video content online, and there’s no doubt in my mind that they’ve succeeded there. I’ve worked as a videographer in the past so I can think of hundreds of options and buttons to add to the device to make it more useful to a professional, but that’s not who the Flip is targeted at. So on the other side of that coin, I can’t actually think of a single function that needs to be removed to make this device easier to use. 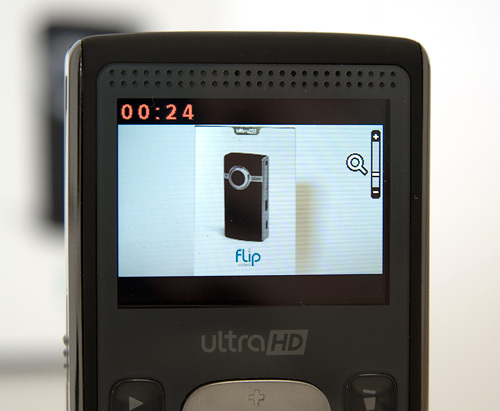 If for whatever reason you’ve got your heart set on becoming the next YouTube star on a minimal budget, the Flip UltraHD or any of the Flip devices should be your first investment. + Easiest hi-def camcorder on the market. + Built in USB connection means you don’t have to worry about carrying extra cables. + Shows up as mass storage compliant device so there’s no need for 3rd party software or drivers to offload content. + Tripod mount helps with stability. + Rechargeable battery easily swapped with standard AA’s. 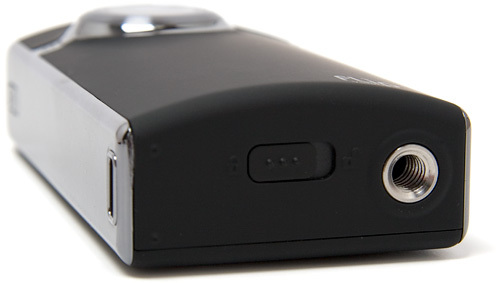 – Compact video devices can lead to shaky footage. – 720P instead of 1080P. – Rolling shutter can lead to jelly artifacts. – Grainy footage in the dark. – No option to switch to a standard-def mode to increase record times. – No built-in lens cap. – Professional videographers will find it too simple. If you have any questions about the Flip UltraHD you’d like answered, please feel free to leave them in the comments, and I’ll try to respond to them as best I can. I picked up one of these for $95 NZD ($60 USD) and it doesn't have any built in storage but supports SDHC up to 32Gb. It allows you to change the recording resolution down from 720P to DVD quality or Web cam quality and does 2hrs of HD recording per 4Gb of storage. 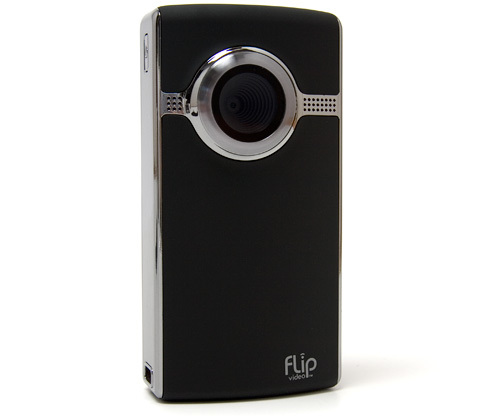 Do you know any good sized tripods that you can buy for the flip ultra HD? The proper sized ones? Thanks. And this review was great. Do you know where i could buy a standard sized tripod for this camera? I can only find mini ones that definitely fit. >>- Compact video devices can lead to shaky footage. b). when I make even gentle moves, the video freezes up for a second, and almost skips to the next frame. I noticed this even in your airshow video. c). the video looks like it is a series of patched-together frames. If I shoot something and move my camera, it almost look like the first frame disappearing and making way for the second frame. d). also, I noticed that the video quality appears marginally better on Youtube. So does this also have something to do with Quick-Time and other conventional players? Hi – this is really useful stuff. Could you also tell me if you can play the footage on a non HD TV? Does it have to be an LCD HD ones? And also, can you just download the video to any PC and send the file over on an email for someone else to open and view? Do they have to have any special software at there end? One more question – does it come with a tripod or is that that an extra? Can the Ultra HD be hooked up to a standard TV that is not high definition?